Our Western European partners thought it was a bad idea then, and do now. Why aren't we listening? Some terrible foreign policy ideas seem to have eternal life. One example is the proposal to expand NATO yet again by offering membership to Georgia and Ukraine. That campaign has gone on for more than a decade and is a significant factor in the West’s deteriorating relations with Russia. George W. Bush’s administration apparently decided that the United States and its European allies had not provoked Russia sufficiently with the first two rounds of NATO expansion. U.S. leaders adopted that attitude even though the second round in 2004 added the three Baltic republics, which had been part of the defunct Soviet Union itself. The administration now pushed hard to make certain that Ukraine and Georgia received membership invitations. Washington’s key European allies began to balk, however. France, Germany, and most of Washington’s other long-standing Alliance partners were unwilling to take that step when Bush formally proposed the first stage in the admission process, a Membership Action Plan (MAP), for both countries, at the April 2008 NATO summit in Bucharest, Romania. Secretary of State Condoleezza Rice recalled that German Chancellor Angela Merkel was especially negative. Merkel “did not trust the Georgians, whom she still saw as corrupt.” The German leader also observed that Ukraine’s governing coalition “was a mess.” Although the primary reason for Western European reluctance was the unsatisfactory domestic political and economic situations in both countries, there also was uneasiness that another stage of NATO expansion would damage already delicate relations with Russia. Despite the intra-Alliance resistance to the Bush administration’s campaign to offer MAPs to Kiev and Tbilisi, though, the outcome of the Bucharest summit was not a total defeat for U.S. ambitions. The summit’s final declaration stated that “NATO welcomes Ukraine’s and Georgia’s Euro Atlantic aspirations for membership in NATO. We agreed today that these countries will become members of NATO.” There was no timetable but the ultimate outcome seemed clear. The country’s deputy foreign minister, Alexander Grushko, stated that NATO membership for Georgia and Ukraine would be “a huge strategic mistake” causing the “most serious consequences” for European peace and security. France has been adamant in its opposition. Then-French President Francois Hollande candidly told a press conference in Paris on February 5, 2015, that Ukraine’s NATO membership would be “undesirable” for France. 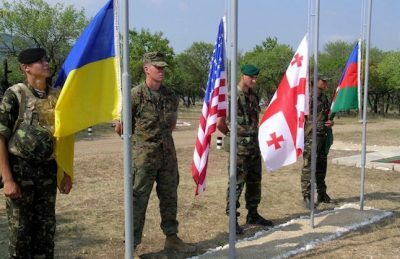 Unfortunately, Washington’s determination to see both Georgia and Ukraine admitted to NATO has not diminished over the years. Even the persistence of severe tensions between Russia and Ukraine since the 2014 crisis has had little sobering effect on U.S. officials or NATO enlargement advocates within the American foreign policy community. Obama left Ukraine and Georgia to fend for themselves, ignoring the politico-military reality that Russia instinctively understood. He thereby left open the vulnerability that Bush had tried to close in April 2008. Many who now oppose robust U.S. efforts to protect Ukraine from Russian depredation and partition assert that we have no serious interests there, and accordingly also reject any hint we might once again consider NATO membership. Yet, in the long term, joining the alliance is the only strategy that can realistically secure Georgian and Ukrainian sovereignty and keep alive the option of joining the West more broadly. That view is worrisome, given Bolton’s position as President Trump’s National Security Adviser. Other vocal conservatives are joining the campaign to secure NATO membership for Georgia and Ukraine. Luke Coffey, Director of the Douglas and Sarah Allison Center for Foreign Policy at the conservative Heritage Foundation, issued a report in January 2018 titled “NATO Membership for Georgia: In U.S. and European Interest” Coffey stated flatly that the United States must “continue to be an advocate” for Georgia’s membership in NATO. The report also urged NATO members at the upcoming July summit in Brussels to reaffirm the commitment originally made in 2008 concerning eventual membership for Georgia. Indeed, the administration is forging close military ties with Kiev even without Ukraine becoming a formal member of NATO. Washington has sent U.S. troops as participants in joint military exercises with Ukrainian forces—an act that Moscow considers especially provocative, given its continuing tense relations with Kiev. Secretary of Defense James Mattis admits that U.S. instructors have been training Ukrainian military units at a base in western Ukraine. Washington also has approved two important arms sales to Kiev in just the past ten months. The policy of restraint that Germany, France and other Western European nations have adopted regarding membership for those two countries is considerably more sensible than Washington’s stance. It is uncertain how firm that resistance will remain, however, in the face of a concerted campaign by influential elements of the American foreign policy community and the Trump administration itself. One hopes that the determination on the part of Washington’s key European allies to shield the United States from its own foreign policy folly persists. Expanding NATO to include Georgia and Ukraine would intrude into Russia’s core security zone. Moscow would not likely let such a menace to its national security go unchallenged, and the results could be tragic for everyone concerned.